Full Title: 'Cambriae Typus Auctore Humfredo Lhuydo Denbigiense Cambrobritanno', printed in Duisberg. 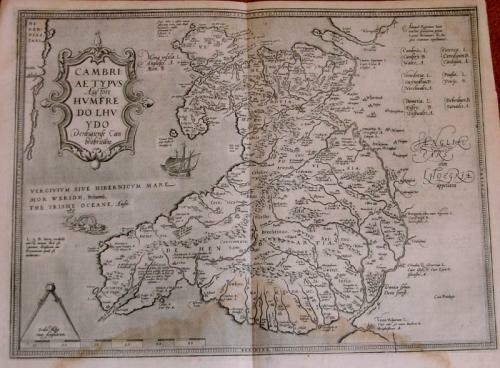 This map was engraved by Pieter van den Keere for the 1607 edition of the Mercator/Hondius atlas, based on the map of Humphrey Lhuyd of 1568, also used by Ortelius. The map is in good condition on strong paper although it has some staining as can be seen in the photograph. The shadow at the centrefold is caused by flash photography.